Spanning a site as large as 4,000 football fields, England has gotten the world’s largest wind farm spinning. The farm can power up to 200,000 homes, and produce 300 MW of electricity and operate for 25+ years. See the AP article for more. Finally some good news on clean energy! As we’ve recently been reminded, offshore drilling is a bad idea for the environment. 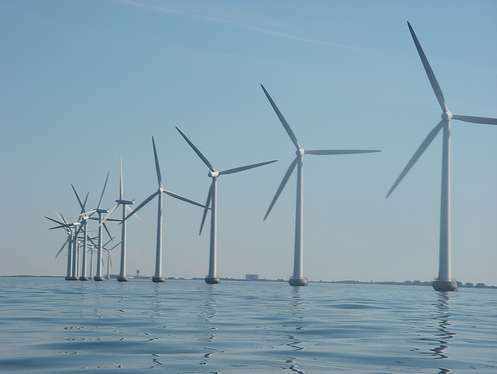 Offshore wind is the way to go. It was announced today by the Interior Secretary that he would approve the “controversial” Cape Wind project off the coast of Cape Cod. I quote controversial since the opponents never struck me as being very credible in their arguments. This decision should have a great impact on prospects for Maryland’s offshore possibilities. Notable excerpts below! Below this is the press release from the US Dept. of Interior. “Audra Parker of the Alliance to Protect Nantucket Sound, an organization that opposes Cape Wind, said the group would move quickly to seek a court injunction to prevent construction from beginning. “We will win in the courts based on facts, not politics,” she said, arguing that the project would violate historic preservation and environmental laws, including the Endangered Species Act. But one legal expert said it was very unlikely that the project’s foes could obtain a federal injunction. At best, said Pat Parenteau, who teaches at Vermont Law School, they might be able to file a suit that delays completion for a couple of years. “Salazar said the project would create 1,000 construction jobs and produce energy equivalent to that of a medium-sized coal-fired power plant. He said it would reduce carbon emissions by the equivalent of 175,000 cars. But George Bachrach, president of the Environmental League of Massachusetts, hailed the decision, saying it was “a critical step toward ending our reliance on foreign oil and achieving energy independence. ” “Those who continue to resist and litigate are simply on the wrong side of history,” he said. BOSTON, Mass – Secretary of the Interior Ken Salazar today approved the Cape Wind renewable energy project on federal submerged lands in Nantucket Sound, but will require the developer of the $1 billion wind farm to agree to additional binding measures to minimize the potential adverse impacts of construction and operation of the facility. A number of similar projects have been proposed for other northeast coastal states, positioning the region to tap 1 million megawatts of offshore Atlantic wind energy potential, which could create thousands of manufacturing, construction and operations jobs and displace older, inefficient fossil-fueled generating plants, helping significantly to combat climate change. Because of concerns expressed during the consultations, Interior has required the developer to change the design and configuration of the wind turbine farm to diminish the visual effects of the project and to conduct additional seabed surveys to ensure that any submerged archaeological resources are protected prior to bottom disturbing activities. Under these revisions, the number of turbines has been reduced from 170 to 130, eliminating turbines to reduce the visual impacts from the Kennedy Compound National Historic Landmark; reconfiguring the array to move it farther away from Nantucket Island; and reducing its breadth to mitigate visibility from the Nantucket Historic District. Regarding possible seabed cultural and historic resources, a Chance Finds Clause in the lease requires the developer to halt operations and notify Interior of any unanticipated archaeological find. Salazar said he understood and respected the views of the Tribes and the Advisory Council on Historic Preservation, but noted that as Secretary of the Interior, he must balance broad, national public interest priorities in his decisions. “The need to preserve the environmental resources and rich cultural heritage of Nantucket Sound must be weighed in the balance with the importance of developing new renewable energy sources and strengthening our Nation’s energy security while battling climate change and creating jobs,” Salazar said. He pointed out that Nantucket Sound and its environs are a working landscape with many historical and modern uses and changing technologies. These include significant commercial, recreational and other resource-intensive activities, such as fishing, aviation, marine transport and boating, which have daily visual and physical impacts, and have long coexisted with the cultural and historic attributes of the area and its people. A number of tall structures, including broadcast towers, cellular base station towers, local public safety communications towers and towers for industrial and business uses are located around the area. Three submarine transmission cable systems already traverse the seabed to connect mainland energy sources to Martha’s Vineyard and Nantucket Island. Visual and physical impacts associated with Nantucket Sound and its associated shorelines abound; it is not an untouched landscape. Salazar disagreed with the Advisory Council’s conclusion that visual impacts from the proposed wind farm, which will be situated between and at substantial distance from Cape Cod, Nantucket Island and Martha’s Vineyard, provide a rationale for rejecting the siting of the project. The viewshed effects are not direct or destructive to onshore traditional cultural properties. In no case does the turbine array dominate the viewshed. The project site is about 5.2 miles from the mainland shoreline, 13.8 miles from Nantucket Island and 9 miles from Martha’s Vineyard. Nevertheless, Interior has required the developer to reduce the number of turbines and reconfigure the array to diminish its visual effects. Moreover, the developer will be required to paint the turbines off-white to reduce contrast with the sea and sky yet remain visible to birds. No daytime Federal Aviation Administration lighting will be on the turbines, unless the U.S. Coast Guard requires some “day beacons” to ensure navigation safety. FAA nighttime lighting requirements have been reduced, lessening potential nighttime visual impacts. The upland cable transmission route was located entirely below ground within paved roads and existing utility rights of way to avoid visual impacts and potential impacts to unidentified archeological or historic resources. These mitigation measures, coupled with the overall distance from which the turbine array will be viewed at any location, will reduce the visual impacts of the project. Lease terms also require the developer to decommission the facility when the project has completed its useful service life, deconstructing the turbines and towers and removing them from the site. The Secretary also disagreed that it is not possible to mitigate the impacts associated with installation of piers for wind turbines in the seabed, noting that piers for bridges, transmission lines and other purposes are routinely built in relatively shallow waters consistent with those found in Horseshoe Shoals. A number of marine archaeological studies have indicated that there is low probability that the project area contains submerged archaeological resources. Most of the area has been extensively reworked and disturbed by marine activities and geological processes. Nonetheless, Interior will require additional and detailed marine archaeological surveys and other protective measures in the project area. A full suite of remote sensing tools will be used to ensure seafloor coverage out to 1000 feet beyond the Area of Potential Effect. More predictive modeling and settlement pattern analyses also will be conducted as well as geotechnical coring and analyses to aid in the identification of intact landforms that could contain archaeological materials. Moreover, the Chance Finds Clause in the lease will not only halt operations if cultural resources or indicators suggesting the possibility of cultural habitation are found but also allow the Tribes to participate in reviewing and analyzing such potential finds. The Advisory Council’s regulations provide that the Interior Department must take into account the Council’s comments on particular projects. The Department, as the decision-making authority, is required to consider the Council’s comments but is not legally bound to follow its recommendations or conclusions. http://www.DOI.gov/news/doinews/Secretary-Salazar-Announces-Approval-of-Cape-Wind-Energy-Project-on-Outer-Continental-Shelf-off-Massachusetts.cfm or at http://go.usa.gov/iE2. More information on the project can be found at http://www.mms.gov. This is a cross-post from Morgan Goodwin at Itsgettinghotinhere, the main blog for the youth climate movement. I’ll just let candidate Obama do my talking on this one. Youth, the millennial generation so inspired by Obama to vote in record numbers, have the most to lose from the expansion of drilling. Even some coastal governors and senators will be angry about the announcement because of the small amount of oil and huge environmental risks. If white-haired governors and senators are worried, what about young people who are thinking about protecting this coastline for us and our children, long after the tiny amounts of energy have been extracted? Obama inspired our generation to turn out to the polls, and he can do it again if he moves to actually inspire us. But youth across the South East have longer memories than this short-sighted political thinking. Under this proposal the first lease sales for drilling would be held in 2012, a year that Obama will be hoping to connect with us and convince us he stands for our interests. If young people don’t believe him, they aren’t going to be inspired to vote. That’s not change we can believe in. We aren’t going to take this. A protest is planned for an event in Florida today where Newt Gingrich will be promoting drilling. Nevermind that he needs to entice people to come with free “Drill Here Drill Now Pay Less” bumper stickers to the first 1000 rsvps, this event shows how dangerously aligned the Obama administration is getting to the industry-cheerleading GOP. President Obama, Ken Salaz and the rest of your teams, hear us loud and clear: young people oppose offshore drilling.